AHS Dean Tanya Gallagher shares her thoughts on the beginning of a new academic year. Read more. The College of Applied Health Sciences welcomed freshmen to campus at our New Student Welcome in August. Read more about the Class of 2014. The College of Applied Health Sciences added two professors to its faculty this year. The Department of Recreation, Sport and Tourism has welcomed Assistant Professor Dawn Trussell to its faculty, and Ian Rice will join the Department of Kinesiology and Community Health as an assistant professor in October. Read more about our new faculty. Two key programs of the College of Applied Health Sciences have added staff this year. Charisse Lewis Whitney joined the Mannie Jackson Illinois Academic Enrichment and Leadership Program (I-LEAP) as an academic coach, while Dr. Shveta Malhotra has assumed the role of visiting associate director in the Center on Health, Aging, and Disability. Read more. Honorees will be recognized at a ceremony on October 22, 2010. Students with severe physical disabilities have a new home on campus. Timothy J. Nugent Hall now houses 17 students who receive the services of the Beckwith Program of the Division of Disability Resources and Educational Services. The University of Illinois broke ground when it dedicated the original Beckwith Hall in 1982, and continues to be a leader in disability services with the opening of Nugent Hall, the first new residence hall in more than 40 years. Nugent Hall enables students with severe physical disabilities to live in integrated housing with able-bodied students. Accessible features include keyless entries, adjustable hospital beds, and SureHands lift technology that increases the mobility of students with disabilities within their rooms. Dedication and grand opening ceremonies for Nugent Hall will take place on the Friday of Homecoming weekend, October 22, at 10:30. Read more about Nugent Hall. Work is nearly complete on the renovation and updating of the Department of Speech and Hearing Science Audiology Clinic. Clinic clients who remember the 1970s-era facility will be amazed by the clinic's transformation. Located in the basement of the Speech and Hearing Science Building, the clinic also has upgraded equipment to provide leading-edge training for audiology students and services for clients. Read more about the Audiology Clinic. 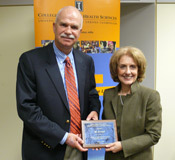 Bo Fernhall, a professor in the Department of Kinesiology and Community Health, received the 2010 King James McCristal Distinguished Scholar Award from the College of Applied Health Sciences. Presented annually to a faculty member in recognition of outstanding scholarship, the award is the College's most prestigious recognition of scholarly achievement. It was established in 1988 to honor former AHS Dean King James McCristal. Read more about Professor Fernhall's talk. Jordan Sestak, a senior in Community Health, spent part of her summer helping to deliver health care services to the residents of Honduras. Her trip was made possible in part by an AHS Career Development and Leadership Award, which is funded by donations to our Annual Fund. Read more about Jordan's trip. 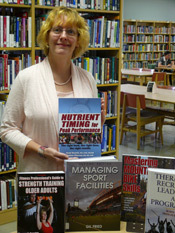 Human Kinetics, the world's leading publisher of informational and educational materials in the fields of physical activity and health, donated its 1000th book to the Applied Health Sciences Library in May. Since 1999, the company has donated a copy of each new book published, from textbooks to how-to books to reference books. Read more about Human Kinetics' donations. 2010 marks the 100th anniversary of the first Homecoming at Illinois. We invite you to join us for a variety of festivities, beginning with the grand opening and dedication of Timothy J. Nugent Hall on Friday, October 22, 2010, continuing through the AHS pregame tent party near Assembly Hall, and concluding with the University of Illinois Alumni Association Post-Game Party at 3:00 on Saturday, October 23, 2010. AHS has a block of stadium and wheelchair-section tickets for sale on a first-come, first-served basis for the Illinois vs. Indiana football game at Memorial Stadium. We’ve also reserved a limited number of hotel rooms at Hawthorne Suites for guests participating in Applied Health Sciences' 2010 Homecoming festivities. Reservations within the AHS block of rooms need to be made prior to September 21. Rooms are available on a first-come, first-served basis. For more information on Homecoming events and to register, visit ahs.illinois.edu, and click on the "AHS Homecoming 2010" sign behind the Alma Mater. Progress on the north addition to Huff Hall has been substantial over the summer. The exterior block is in place, the concrete slab for the upper floor has been poured, and roof trusses are in place. Once the building is enclosed, the focus will shift to the interior of the building, including electrical and plumbing work, interior walls, and so on. Exterior brick work will take place simultaneously. We are on track for a Spring 2011 dedication, so stay tuned for more news about that. In the meantime, you can follow the progress of construction through our Web site. Visit http://huffnorthaddition.ahs.illinois.edu/ and click on "Construction Progress Gallery" in the top navigation bar. If you're here for Homecoming, be sure to stop by Huff Hall to see the addition taking shape. Over the last seven years, six members of our faculty have received the highest award for teaching excellence at the University of Illinois at Urbana-Champaign. We are proud of the outstanding work of our professors, and deeply committed to ensuring the highest quality teaching in all of our programs. This year, we'd like to give you an opportunity to nominate a current faculty member who has made a lasting impression on you. The nomination form is available on the AHS website. We hope you'll consider submitting a nomination so that our faculty continues to receive well-deserved recognition for excellence in instruction. If you have questions about the award or the nomination process, please contact Renique Kersh, Assistant Dean for Academic Affairs, at rtkersh@illinois.edu.